I have often said that if I had to choose one type of cuisine to live on for the rest of my life, I would choose Mexican. Tasty and satisfying, it’s simple, and simply my favorite. Diego’s Mexican Food & Cantina, a comfortable spot in the heart of Denver’s 16th Street Mall, confirms my decision that Mexican is the best. Cooked from old family recipes and traditions, Diego’s is owned by Castle Pines residents Jennifer and Anthony Terrones and their extended family. Also in keeping with Mexican tradition is the friendly and helpful staff, who will greet you and make you comfortable from start to finish. The restaurant is casual and inviting, a great place to join a friend or your whole family for drinks and dinner. Recipes, like the carne adovada – a tasty pork steak marinated and served with sliced potatoes and beans – come from old family favorites that the Terrones family brought with them when they emigrated from Chihuahua, Mexico in 1911. Another favorite, the green chile, has won several awards at Civic Center Park’s yearly Cinco de Mayo celebration. At Diego’s the house mix margaritas are fan favorites, as are the selection of tequilas at the Tiki Bar. A central location and a restaurant that can seat up to 350 people make it a great location for hosting an event like a rehearsal dinner or a party. “We have a great atmosphere and we can accommodate large groups,” said Jennifer. The Terrones family often shares their culinary talents with local groups here in Douglas County, too, notably at their children’s schools. They recently donated a catered lunch for the faculty and staff of Timber Trail Elementary during the school’s Teacher Appreciation Week. 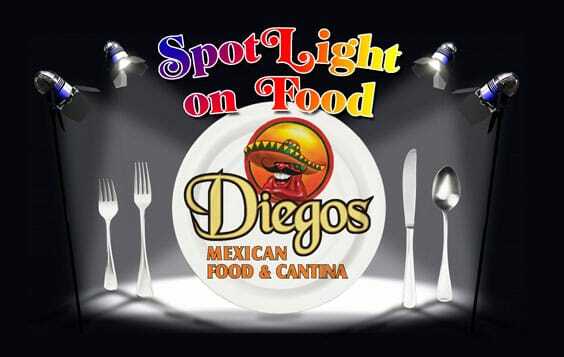 Diego’s is located in Denver at 1600 Champa Street on the lower level. For more information about menus, events and catering, visit www.diegosdenver.com. Home cooking, Mexican style. At Diego’s you can enjoy standard favorites like tacos and burritos, as well as house specials like carne adovada and green chile made with locally-grown ingredients.